Container gardening or planting in a flower planter is a good way to provide color in a small space, such as a patio or walkway. 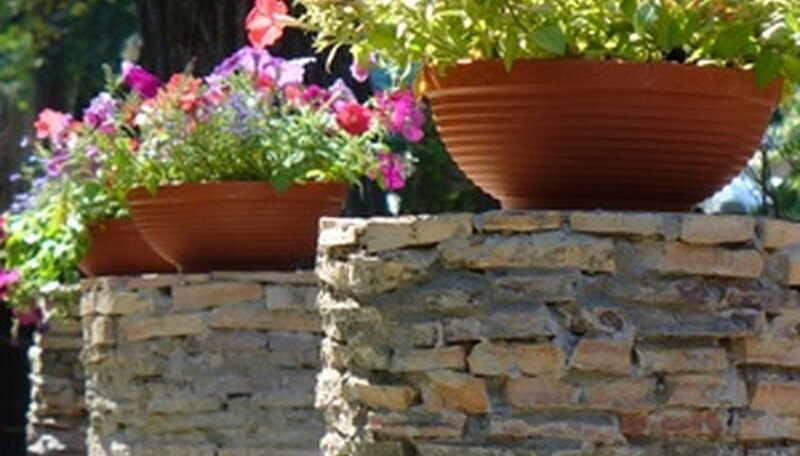 Flower planters are convenient for people with limited mobility and those with problem soil. Design of flower planters is limited only by your imagination, but there are a few thing you should know when it comes to designing flower planters that will make your container gardens or flower planters more beautiful than you ever imagined. Find the right container for the space you are designing. While a simple plastic container is fine for some spaces, you may like to have a beautiful or unusual container for an area that is easily seen. Choose a container with holes in the bottom for drainage. Things to look for when shopping for a container are scale and color. Scale means a container that fits in with the landscape. A container that is too small will seem overwhelmed by its surroundings and be difficult to keep moist. A container that is too large will look odd on a small patio or in a yard. The color of the container should complement the color of any nearby structures or you can choose a color that will complement the flowers in the container. Choose the right plants for the container by finding the eventual height and width of the plants. Plants that are too crowded will be stunted and may not perform as desired. A rule of thumb when designing containers is the height of the tallest plant should be about one and one-half times the height of the container. For example, if a planter or container is 12 inches high, then the tallest plant should be 18 inches tall, measuring from the soil level to the top of the plant. Look for a variety of plants with different textures. For example, design the container so a flowering plant that cascades over the side is in front of a plant that grows in a mound shape with an ornamental grass planted in the back. Planting plants with the same shades of color, such as red or yellow, makes a dramatic statement in the appropriate setting. Choose plants with the same light and moisture requirements for the flower planter. For example, if the container is located in full sun, do not add shade-loving plants. Plant the chosen plants in the planter with the tallest plants in the back and shortest, or cascading plants, in the front if the planter is viewed from one side. If the planter is seen from all sides, plant the tallest plants in the middle and smaller or trailing plants around the sides. Use a good-quality potting soil rather than garden soil. Add a layer of finely shredded mulch between the newly planted plants to give the planter a professional and finished look.